The Postal Regulatory Commission (PRC) recently approved the USPS proposed price changes to Mailing & Shipping Services products. 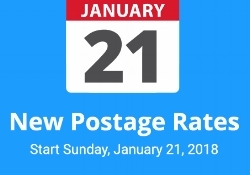 The new rates will go into effect on January 21, 2018. Last week, our team participated in a LUNCH & LEARN about IRRESISTIBLE MAIL - WHEN PAPER & PIXELS CONVERGE hosted by the USPS. Now more than ever, direct mail has become a sensory, interactive experience that's getting a lot of attention as well as results. Our data echoes industry trends. Year to date, our direct mail business has experienced 42% growth over where we were at this same time in 2016. In addition to growth, we're experiencing a heightened level of creativity in overall direct mail design that incorporates sensory and technology user experiences into omni-channel marketing strategies. You can learn more about IRRESISTIBLE MAIL via a FREE (and gorgeous) SAMPLE BOOK to help make your next marketing campaign irresistible! Sign up for your free copy HERE. THE USPS recently published STILL RELEVANT: A LOOK AT HOW MILLENNIALS RESPOND TO DIRECT MAIL. Given our fascination with the brain, we're particularly fond of the section dedicated to How the Brain Responds to Print vs. Digital. Scientific data continues to clearly indicate that print is alive and well and creating desired results. Our print pros can help you create personalized direct mail. Ask us how HERE.